I see 6/14/51 and 0/7/54 being popular. Essentially one is straight-up raid PvE dps. The other is raid PvE dps with the new replenishment. Neither end up using Aimed Shot. I've become used to having Aimed Shot around. One will use multishot, the other arcane shot for the regen. It's all subject to change of course. And there appears to be a talent missing. "New Talent: Trap Launcher: When activated, your next Trap will be launched instantly at the enemy target. 1 minute cooldown." That could certainly put a different spin on Trap-Dancing. It is hard to see where it would fit in the tree. Maybe it is just bogus and wishful thinking of someone and got into the feed somehow. Glyphs are not instantly clear which to use. Are all attractive. But so are the Steady, Serpent, and Hawk glyphs. I'm guessing that Kill Shot will be more for PvP. Doubling the Kill Shots in PvE is nice, but probably not as good as Explosive Shot. So, yes, I'm tipping my hand. I'll probably try out ES, SS, and SrpS. So I've finally ground out the rep for the Oracle Talisman of Ablution yesterday. I'm not exactly sure in what cases I'll use it. I'm thinking solo'ng, and 5mans, and some PvP would make sense. I don't want to run out of mana in any of those cases. And I'm likely to get the killing blows in many of those circumstances. I have no idea if I'll use it in 10 and 25-man PvE. Probably never in 25mans. Maybe in some 10man situations, but rarely. Right now I've got it on as a single gear item in my outfitter bar, so I can flip it in conditionally before a fight. 5mans and soloing make tons of sense. PvP will be tougher because I'll either give up my Mirror or my get-out-of-jail trinket. In trying it out a tiny bit, I'm getting 530 to 545 mana back per kill. That's completely unbuffed and just in slightly different gear sets. It's supposedly 5%. And yes, it's each and every time without seemingly any cooldown. I'll grab my gorilla and do some AoE farming. Heck, maybe I'll dig out two Tier-5 pieces and get some infinite farming set going. Hit capping is the first thing every hunter should do to increase their dps. Remove 1% miss[*] and you'll up your dps by 1%. It's also generally pretty easy. 1) Pets inherit their hunter's hit percentage in whole numbers rounded down. So if you have a 260 +hit, then you have a +7.93% hit percentage. This means your pet only has a +7% hit percentage. 2) Pets do not benefit at all from a hunter taking Focused Aim. It only benefits the hunter. 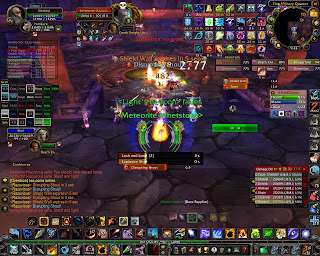 3) Bonus: If you have a Draenei in your group and in range, you get an extra 1% to hit, so you only need 229.53 +hit. What's all this mean? For the BM hunter, you want to have a solid 263 +hit rating or slightly more -- not slightly less. They should not take any Focused Aim! BM hunters also want Animal Handler 2/2 so their pet doesn't miss due to dodges. 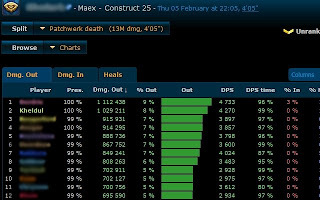 A BM hunter's dps lives and dies with their pet's dps. For a SV or MM hunter, your pet is already missing a bit and is a much smaller part of your dps. You should avoid Focused Aim if you can, but it's an option. As I steadily improved my gear I lost more and more +hit. (Despite gemming for it a lot.) So, I've dipped one toe in. As far as my latest gear connundrum, I'm trying to figure out if I should make a strong grab for Grim Toll next time it drops. It would let me get a talent point back, and/or re-gem for Agility. That's pretty nice. However, there are some other tasty trinkets out there. [*] - "Miss" as far as WWS reports go may also include dodges (or aggro-forbid, parries). True misses may also occur frequently if you're in a Archavon cloud. So on Thursday with less than an hour to go in our normal raid time, we finished a wing and headed to OS-25. We went straight for "one drake up"and in a few wipes got him. I'm very proud of our guild. 17 people hadn't done any "drakes up" before. Positioning of the boss was different in 10 and 25 man. It seemed more difficult in 25man. We tanked him in the center, but it worked out. However, we didn't get Tenebron down fast enough to try "two drakes up". And I think positioning and targeting was a big part of that. Random DCs ensuring raids fail. Pet Cower Random-Auto-Cast never getting fixed. Pet Prowl Auto-Cast-On-With-Zone-In never getting fixed. Doing more dps by trap-dancing than standing at 31 yards. Devilsaur hitboxes larger than 1.0 Heigan value or 0.75 OS-25 lava wave diameter. Kill shot still not working under 8 yards. Not getting to see my devilsaur, Chuckles. /sniff. Pew-pew! Not an especially easy number. But I was impressed how well Kill Shot resembles its name. Not instaGlib, but pretty nice. Tues Raid: Strong-Handed Ring and Aged Winter Cloak. 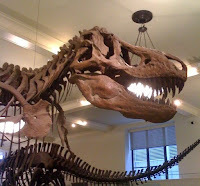 Thurs Raid (today): Museums, Theatre, and Good Eats in NYC. I only play with a 19" 4:3 monitor. When I'm in a 25man, the buff list gets pretty big. I have a bunch of new buffs occur during combat that I already have Power Auras or NeedToKnow set up to visualize. Specifically: Lock and Load, my Meteorite trinket procing, my Replenishment, Expose Weakness, etc, etc, etc. I would like to exclude those buffs from showing up in any buff list. I already have them covered. What addon can help me here? Okay, not exactly a bird. But I was still struck by how nice these things looked. It had been a while since I was on one. For raids, you'll generally want to have your /focus set to a tank. This allows you to one-button-press establish a MD to that tank. If you're the only hunter, you get the MT. If you have help, doing the OT is sometimes more work than MD'ng to the MT and sometimes just not necessary. Using a focus as the primary targeting mechanism lets you easily oh-sh17!-MD mobs with much more efficiency. On a boss-fight, it lets you easily stack threat on the tank to give them as much head-room as they may need. If you're using MD and have to then click the tank or even mouse-over their raid icon, then you're spending too much time doing it. Press/Click: does a MD to your focus target. If you don't have a focus target or your focus target is dead, it gives you a normal MD cast. Click+Shift: does a MD to your pet if its out and alive, regardless of what pet you have out. If you don't have one alive and kicking, it gives you a normal MD cast. Click+Control or Click+ALT: Even if you have a focus, it will allow you to manually control where to apply the MD. This is good if you need to balance out a second tank in a boss threat list. a) Do you understand threat and have a good threat meter like Omen3? b) Do you know how to set a /focus and /clearfocus? They're all easy to try and research. c) Do you think it's crazy to set your focus to your own tank? Clearly there are some good occasions to set your focus to a hostile mob, but those are fairly rare and more suited for PvP. /e will be misdirecting %T to %F. [*] - Yes, you can have an addon to accomplish similar stuff. 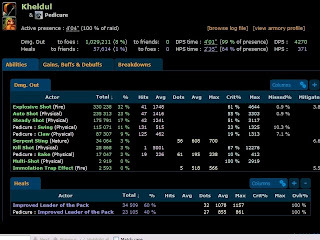 If you are trying to slim down on your addons, this is an easy one to have as a macro instead. [**] - Bug is left to the reader / macro-hacker to discover. There's plenty of room for disappointment. Talents, spell coefficients, etc. Just wait. Blizzard doesn't let us really try things on the PTR. They told us our PTR testing of 3.0.8 wasn't real. They make hotfix nerfs. I'm fairly convinced that Blizzard's only reliable testing and analysis comes from live production stats. i.e.- "The Big Lab". In the meanwhile, I hear a lot of hunters have decided to become untalented, dropping to a 0/0/0 spec in a sign of protest following the hotfix nerf. I can understand the feeling. The amount of change and feeling of persecution after working gathering and preparing and just getting slammed on the head instead of a feeling of some level of progress. It is very tempting -- and mature -- to put your hunters on hiatus until the dust settles. I seem to still be able to significantly contribute to raids so I'm still probably a straw away from breaking my back. •Consumable ammunition has been removed from the game. Arrows and bullets no longer stack, but are not consumed. Ranged attack speed bonus gained from quivers and ammo bags will be preserved in a different capacity. •A new tier of hunter pet talents have been added. In particular, this allows Beastmaster hunters to improve their damage per second (DPS) with their 51 point talent. •Hunting Party – this talent has been reduced to 3 ranks and also grants a passive bonus to the hunter. •Piercing Shots – this talent has been changed. Your Aimed, Steady and Chimera Shots cause the target to bleed for 10/20/30% of damage dealt for 8 sec. •Sniper Training – this talent has been changed. After standing still for 6 sec, you gain a 2/4/6% damage bonus to Steady, Aimed and Explosive Shot. •We are also looking to add additional trap functionality to Survival. + Ammo seems like marketing and the design team throwing us a bone. Sure it will save a pile of gold that other classes don't really even know about. + The bleed effect for MM is hopeful. - It "feels right" for "Sniper Training" which is something Blizz always shoots for. Then again, they've tried to make it work with Steady Shot and Aimed Shot before. + BM gets to dps a little more, but not through collaboration with their hunter's talents. That said, I'm sure they'll screw around with almost every talent, talent location, and spell coefficient. And ammo damage is in every formula. Swappin' in my freshly enchanted Bands of Anxiety so I can get some more +hit. Put Icewalker on my new Crippled Treads instead of agility, just for the little bit of +hit. I still don't really know where I dropped so much +hit. I know my swap-out of my blue polearm hurt a little, but not sooo much. Have you fallen into the achievement complete-ness phase? 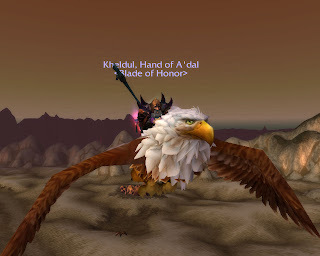 I felt like finishing off the Northrend heroics on Sunday. For whatever reason I hadn't run HoL in heroic. 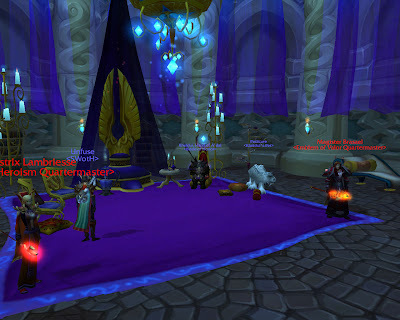 The other hold-out was Heroic: Ahn'kahet: The Old Kingdom. That made sense, because I had "finished" it a bunch of times but skipped the two optional bosses. It also makes sense because you "only" have 60minutes to complete the quest at the final boss. Anyway, both are now done and I feel better. Most of it was just wanting to see all the content. But that's a little incorrect since I saw all but the toadstool boss in Old Kingdom. Now I look at my dungeon achievements and see all the Burning Crusade heroics that I ran endlessly. Most of them are listed as incomplete -- according to the achievement system. The same with old world content. The same with raids. I have 145+ days "/played" on this character. Much of that time was in 5man or raid instances. BTW, there's an interesting thread about solo'ng instances over here.